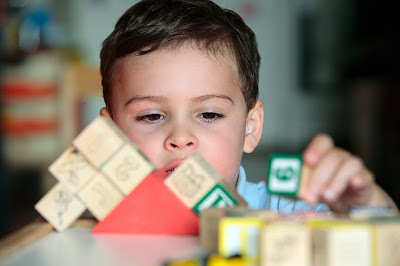 Spatial skills gives the child the ability to manipulate images in his or her mind and apply it to the physical world. Think of it as showing a child a picture of a stack of blocks, spatial skills allows the child to recreate the structure using real blocks just by looking at the picture. In a study by Susan Levine, a psychologist at the University of Chicago, she notes that pre-school children who hear parents use words describing the size and shape of objects, (like "big", "small", "round", "tiny") and who then use those words in their day to day interactions do much better on tests of their spatial skills. The study is the first to show that teaching children to use a wide range of words relating to size and shape may improve their later spatial skills. The study notes that children aged 1 to 4 yrs old who have heard and then spoke 45 additional spatial words describing size and shape had an average of 23% increase in their scores on non-verbal assessment of spatial thinking. The study is published in the current issue of Developmental Science. Lead author Shannon Pruden, assistant professor of psychology at Florida International University and former postdoctoral fellow at UChicago, and Janellen Huttenlocher, the William S. Gray Professor Emeritus in Psychology at UChicago joined Levine in the study. Levine says,"In view of findings that show spatial thinking is an important predictor of STEM (Science, Technology, Engineering and Mathematics) achievement and careers, it is important to explore the kinds of early inputs that are related to spatial thinking,"
STEM (Science, Technology, Engineering and Mathematics) education is important for the current crop of science and technology innovators. A National Science Board report in 2007 state that in order to succeed in a highly technological society, students need to develop their STEM capabilities to levels far more above than acceptable levels the previous years. Enhancing spatial thinking is an important component of achieving this goal. Soo-Siang Lim, the Director for the Science of Learning Centers Program at the National Science Foundation, says, "This study is important because it will help parents and caregivers to better recognize and to seek opportunities that enhance children's spatial learning. Study results could also help spatial learning play a more purposeful role in children's learning trajectories." Levine discusses the research and the study in the video. The research was supported by the National Institute of Child Health and Human Development and an award from the National Science Foundation’s Science of Learning Center program to the University’s Spatial Intelligence and Learning Center.